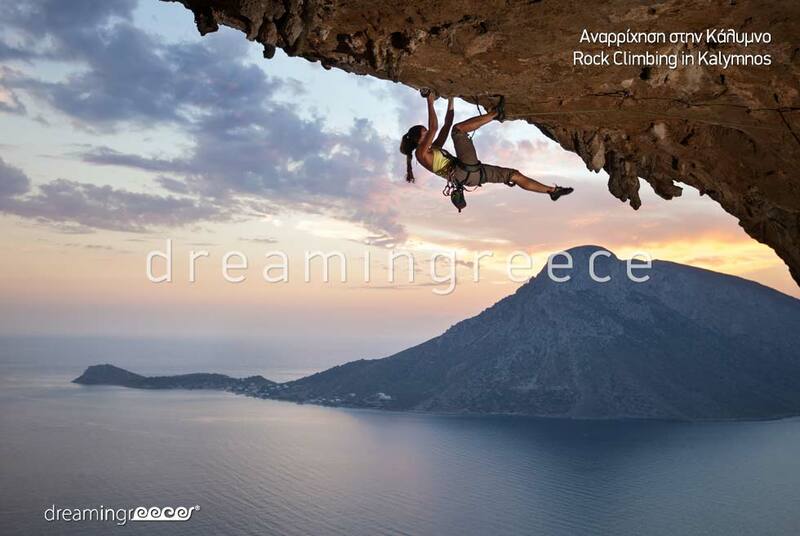 The seductive Kalymnos; the famous island of sponge divers, belongs to the Dodecanese Complex. The wild beauty of the mountain landscape, the caves, the beautiful beaches, the enchanting sea and the history which is intrinsically linked to sea legends and adventures make up the profile of this special place. 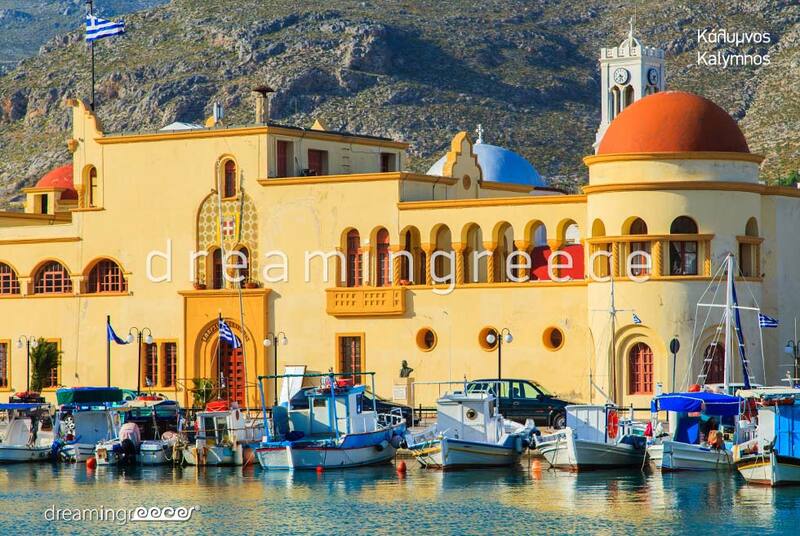 The capital and port of Kalymnos is Pothia; a colorful village, unfolding at the foot of two opposite hills. Walk in the streets among old mansions, impressive captain houses with colorful shutters and courtyards drowned in basils and geraniums. While strolling around the city, your attention will be stimulated by the impressive buildings of the Eparcheion and the Town Hall, which testify the period when the island was under the Italian occupation. On the west side of the harbor, the major temple of Agios Savas, from where you will have the opportunity to enjoy panoramic views of Pothia, stands out. Major attractions of this island are the historic “Ai Mousai” (The Muses) Reading Room, the cathedral of Metamorfosis tou Sotiros Chirstou (the Transfiguration of Jesus Christ cathedral) as well as the church of Agios Nicholaos. In Pothia you will also find ouzo taverns, small cafés, bakeries and traditional sponges’ laboratories. Further down from Pothia there is the previous capital of the island: Chora or Chorio. To the north of the village, Megalo Kastro (Grand Castle) perched at the top of a steep hill, and opposite this, Chrisocherias Castle lie. Beneath Chrisocherias Castle, there are three stone windmills; the island's benchmark. Major attractions of Chora are the ruins of the churches of Jerusalem Jesus and Agias Sofias. One of the most beautiful "corners" of the island is Vathys; a village perched in a fertile valley with citrus trees. This is a green oasis in this infertile and rocky island. In Vathys, a beautiful fjord, which leads to the picturesque harbor of Rina unfolds. The narrow bay which is surrounded by high and steep cliffs, combined with the tranquil blue sea creates an image that seems to have sprung from a painting! 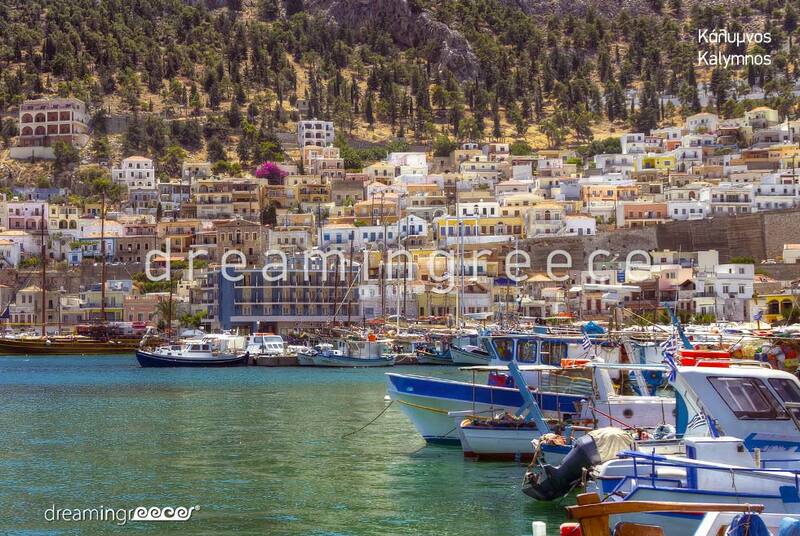 It is worth enjoying a glass of ouzo and fresh seafood in the picturesque harbor, overlooking the fishing boats. Besides the indescribable beauty, the area presents great historical interest as well. There are the early Christian settlement of Rina, the archaeological site Embola-Taxiarhis Michael Fortress and the Hellenistic outpost "Prison". 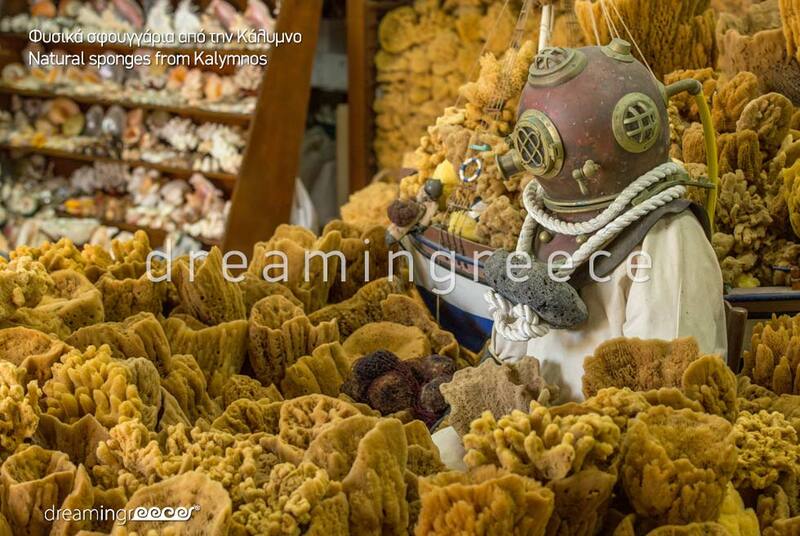 Kalymnos is not only known for its sponges. The island of sponge has now become a "Mecca of climbing", as it has steep, towering cliffs, with countless special routes. If you are a sports fan, it is worth attending the Climbing Festival. If you love diving and snorkeling you will be enchanted by the extremely rich waters of Kalymnos. Colorful reefs, sea caves and ancient wrecks found at the bottom of the sea are waiting to be discovered! On the island, a School Divers, as well as various organized diving centers, offer diving experiences in points of indescribable beauty! It is worth attending the “Diving Festival and Freediving Games”. The experience will be unforgettable! This island is a paradise for nature lovers as well as hikers. You can find yourself at its wonderful trails discovering the beautiful "corners" of Kalymnos. Because of its rocky composition, Kalymnos has numerous caves, connected with fascinating legends, some of which have archaeological interest. Especially, it is worth visiting the Cave of the Seven Virgins, Kefalas Cave as well as the relatively inaccessible Daskaleio. The island of sponge hosts several interesting museums, including the Maritime Museum of Kalymnos, the Archaeological Museum of Kalymnos, Kalymnos House and Valsamidis Museum of Marine Findings. During your stay in Kalymnos, do not forget to visit the nearby Pserimos and Telendos islands; ideal for those seeking tranquility and relaxation. In these islands you will find beautiful beaches and taverns. 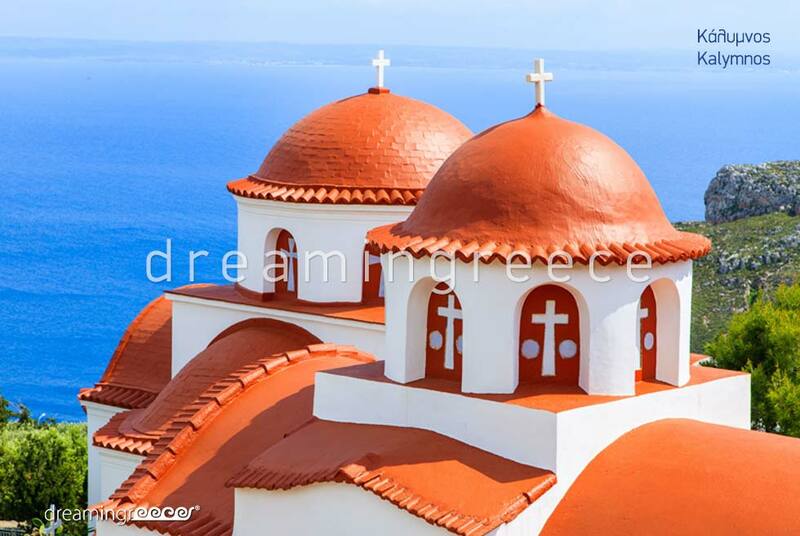 It is worth visiting the church ofAgios Georgios in Telendos, which is perched on high rocks and enjoy a marvelous sunset! This island is ideal for Easter vacations as celebrations there are special and literally explosive; every year the customs of sponges divers’ separation from their families, and dynamite explosions, making mountains to shake, revive. The experience is unique! On the sponge divers’ island, the magic of the seabed meets the wild beauty of the mountains, creating an Aegean paradise, full of surprises. Climb in extremely beautiful fields; dive into the magical waters; walk in trails of untold beauty and slopes where the aromas of thyme, oregano and alisfakia herbs amaze you; where charming fairytale caves and shipwrecks create a place that excite the imagination and promises a unique experience... This is Kalymnos. This island is surrounded by a beautiful coastline with crystal clear waters. Within walking distance from Pothia you will find Therma beach. Further down, there are Vlychadia beaches; two beaches one with sand and the other one with pebbles. Unique experience is swimming in the narrow bay of Rina in Vathy. On the west coast of Kalymnos, Platis Gialos beach; famous for its black sand, unfolds. You can stay on the beach until sunset and enjoy one of the most idyllic sunsets on the island! On the same side of Kalymnos, you will encounter the popular Kantouni beach with its famous beach bars. On the slope which rises at the southern end of the beach, Stavros monastery (monastery of the Cross) stands out. The way up to the monastery offers stunning views over Panormos, Agia Kyriaki islet as well as Telendos. Patelas Rock divides the beautiful Kantouni beach from Linaria beach which is ideal for families. In this romantic "corner" of the island, you will find picturesque taverns by the sea. On the same side of Kalymnos there is the small, organized beach of Melitsaha, with shallow waters offering views over Telendos. Another beach with great views of the islet of Telendos is Myrties pebble beach. The lively, organized beach of Massouri is famous for its beach bars and loud music and attracts mostly the youth. The beach is sandy, has organized sections and offers beautiful views of Telendos. Those who love isolation will love the pristine beaches Almyres, Palionisos, Pezonda, Kambi and Dasonda which unfold on the eastern side of Kalymnos and are accessible by boat. On the north coast of the island the windswept beach of Emporio; recommended to lovers of wind and kite surfing, lies. It is also worth visiting the neighboring Pserimos island and swim in its quiet beaches. Finally, in the tiny island of Telendos, you will find beautiful beaches such as Potha, Chochlakas and Pnigmenos. To reach the island of Kalymnos, you can fly directly from Eleftherios Venizelos - Athens International Airport. You can reach Kalymnos by boat, from the port of Piraeus, on the Blue Star Ferries line. For more information on the itineraries visit the company’s site. The island of Kalymnos is connected by boat with the islands of Syros, Mykonos, Amorgos, Agathonisi, Pserimos, Astypalea, Patmos, Lipsi, Leros, Kos, Nisyros, Tilos, Symi, Rhodes and Kastelorizo. For your transportation on the island you can use the local buses, as well as taxies, which can take you to any important destination on the island.